The White Chocolate Grill in Park Meadows Mall brings high-quality American Dining to a neighborhood with plenty of competition. Recently opened, the restaurant offers an approachable menu which allows diners to pop in for a great burger or salad while shopping or locals to celebrate a night out with a bottle of wine and Wood-Grilled steaks or Seafood. Metromix.com lauds The White Chocolate Grill as a “well-edited menu of burgers, sandwiches and wood-fired meats and seafood.” The restaurant offers unique, from scratch selections like Tomato-Gin Soup, Filet Mignon Cobb Salad, Parmesan Crusted Filet and Citrus-Soy Salmon. Of course, one can’t leave without trying a from-scratch white chocolate dessert like the French White Chocolate Bread Pudding. 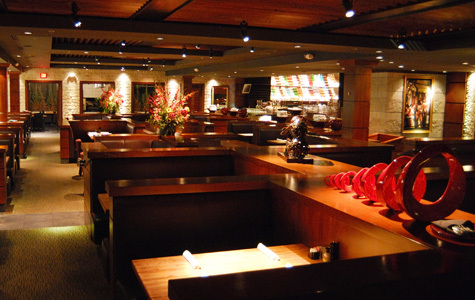 The decor is warm and comfortable with leather booth seating, dark wood and natural stone finishes. An exhibition kitchen puts on the show while modern jazz plays away. A backlit wall of artfully arranged liquor bottles sets the scene in the lounge where happy hour is hosted Monday-Friday from 4-7pm. Ample Parking. Reservations Accepted. Patio. Full Bar. Kid’s Menu. Free Valet on weekends. Click here to sign up and get a $20 Gift Card to WCG for only $10. For Reservations Call: 303-799-4841 or click here.